Preserve Your Natural Tooth for Years to Come! Even when you practice oral care, sometimes dental cavities happen. When you’ve got tooth pain or Dr. Gonzalez tells you that there’s a cavity in your tooth, he can help you restore your smile and make chewing easy and comfortable once again. However, he doesn’t use the traditional silver fillings you may be used to or have heard of before. 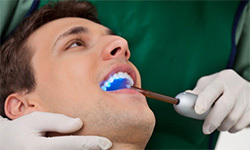 Instead, he opts for tooth-colored fillings that offer a more natural appearance. If you are ready to restore your smile, contact our office and speak with one of our knowledgeable team members! Tooth-colored fillings are nothing like silver fillings which utilize mercury and multiple other metal alloys to restore teeth. 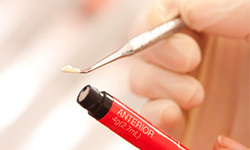 Instead, tooth-colored fillings utilize composite resin, which is a mixture of both plastic and glass. This putty-like resin is not only capable of blending in with your teeth, but highly biocompatible. Those with metal allergies will not have to worry about triggering a reaction when using tooth-colored fillings to restore their teeth. Once packed into your tooth and cured, you can chew again with ease! Silver fillings have long been considered the gold standard for restoring teeth, but now we can say with confidence that tooth-colored fillings offer very similar protection, along with numerous other benefits you won’t find with their silver counterparts. For example, composite resin does not require removal of any tooth structure to place because it maintains a strong natural bond with enamel. Silver fillings typically require removal of tooth enamel to fit properly. Furthermore, silver fillings often expand and contract over time as they become exposed to food and beverages of varying temperatures. This phenomenon causes the filling to act as a wedge between teeth, further splitting them apart. Composite resin does not react to stimuli in this way, helping you maintain a stronger seal for longer. 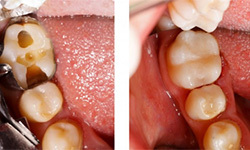 In just one visit, you can have your damaged teeth repaired with tooth-colored fillings. After examining your teeth for damage, Dr. Gonzalez will numb the tooth in question and remove any damaged or decaying tissue. Then, he’ll place an etchant material to give the resin a more effective bond. Once the resin is packed into the tooth and properly shaped, he’ll use a special curing light to harden the material instantly. You won’t have to worry about the material blending in because the shade will be determined prior to placement. Maintaining your dental fillings in San Antonio is as simple as brushing your teeth twice a day with fluoridated tooth paste, flossing daily and visiting our office once every six months for cleanings and exams. By committing to oral hygiene, you’ll avoid future cavities and be able to catch early signs of decay before cavities appear. When brushing, make sure to not brush any longer than two minutes at a time unless instructed by Dr. Gonzalez. Use a soft-bristled toothbrush to prevent wearing the filling down prematurely. In the event that your filling is damaged or you’d like to have a silver filling replaced, we can typically do so in a single visit.